Summary: Tony Medina has written thirteen poems in tanka form (5-7-5-7-7), inspired by photos of the Washington D.C. neighborhood of Anacostia. The poems capture emotions from despair (“Payday don’t pay much/Every breath I take is taxed/The kind of life where/I’ll have to take out a loan/To pay back them other loans”) to hope (“I went to this school/When I was a shawty rock/Breakin’ in the yard/Wanted to be a rap star–/But a teacher’s not too far!” with an illustration of a young man in dreadlocks teaching science to an enthusiastic group of students). 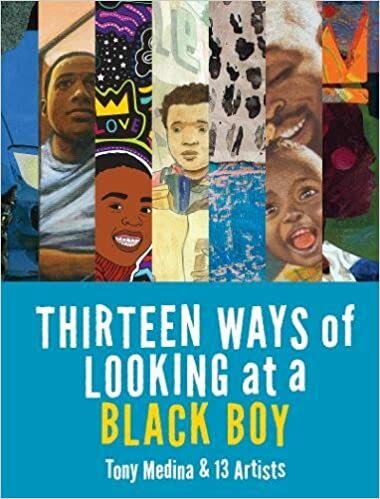 The opening two pages are a free verse meditation on black boys ending with “We celebrate their preciousness and creativity/We cherish their lives”. Includes profiles of the thirteen artists who provided the illustrations and an author’s note about the title of the book, the tanka form of poetry, and the Anacostia neighborhood. 40 pages; grades 2-6. Pros: A celebration of African-American boys in deceptively simple poetry, with a wide variety of beautiful, intriguing artwork. Kids who have mastered the haiku may be inspired to attempt the more complex tanka. Cons: Although I liked the compact size of the book, the artwork seemed to warrant a larger, picture book sized format.